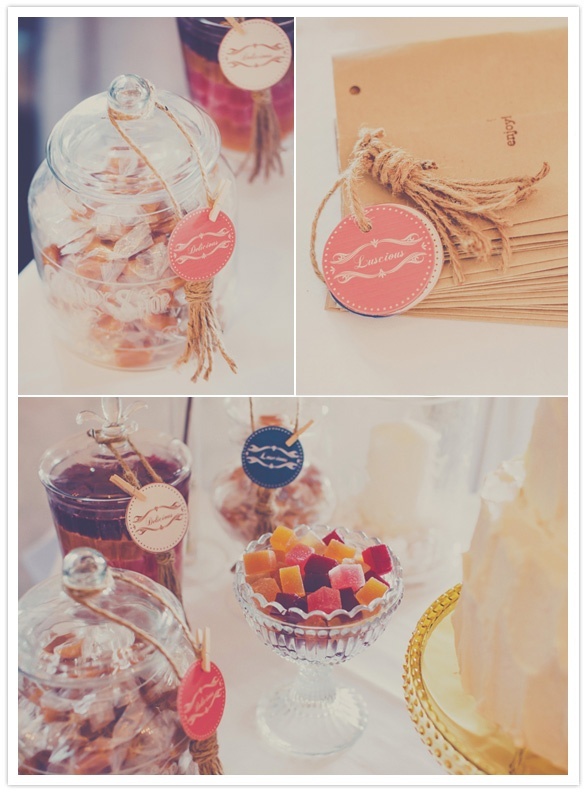 There are so many fun ways to display sweet treats in a fashion that will compliment your wedding day theme. 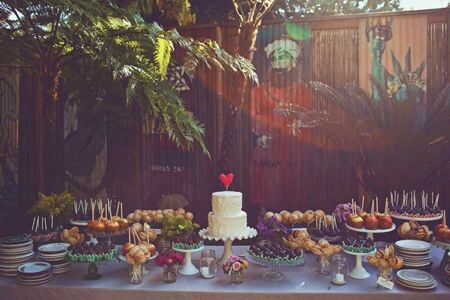 The following dessert bars take it to that next level with creative flair: fabric banners, pennants, eclectic cake stands, painted wooden signage, suitcase props, and gorgeous flowers are just the beginning. Our delicious treats can surely wow on their own, but why not take it further and make a bold statement that tempts with the eyes and keeps it playful until the sweet finale? Hopefully this collection will inspire your creativity as much as it does ours. The dessert bar from our Marfa wedding was an eclectic mash-up of our wedding design elements: crepe fringe, antlers, mexican tile, dehydrated ocotillo, and pink! Photo by Natalie Shelton of NBarrett Photography. Cake by Lisa Copeland of Austin Street Cafe. Desserts by Maiya Keck of Maiya's Restaurant. Flowers by Alicia Rico of Bows and Arrows. This beautifully eclectic assortment shines in the simple playfulness of its pieces. 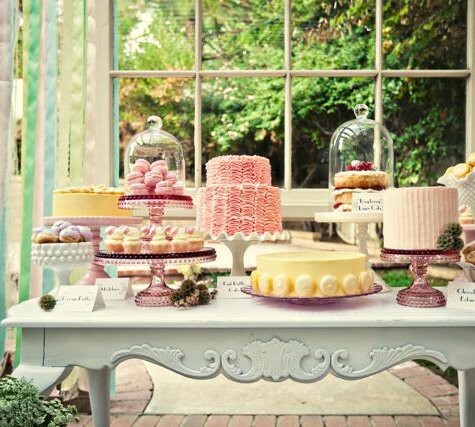 Love all the tiny treasures this table has to offer from the mixed china dessert plates to the tiny floral arrangements to all the bite sized treats arranged on a collection of small stands. The white cake while small makes a big statement and the crafty topper couldn't get any cuter. This feminine assortment is creatively displayed in an exposed cupboard, a perfect example of making the ordinary striking by playing with context. Love the pattern play and small details. 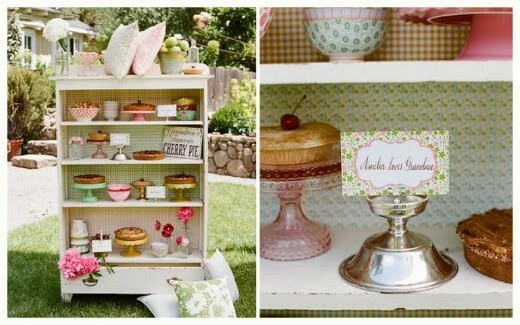 Perfect for an afternoon tea themed wedding! The elegance of bell jars, gold, calligraphy, gilded tassels, and minimal dessert pieces give this spread an old world charm feel, as if stumbling upon F. Scott's secret sweet stash. Small cakes and pastel-hued cupcakes cluttered on a small table atop mixed vintage glass stands adds a playful, retro vibe to this vintage wedding. I love how each dessert takes on a personality of its own by playing with size and texture but still keeping it simple. For a playful barn wedding, crafty banners, wood grain pieces and a "sweets stable" sign couldn't be more adorable. 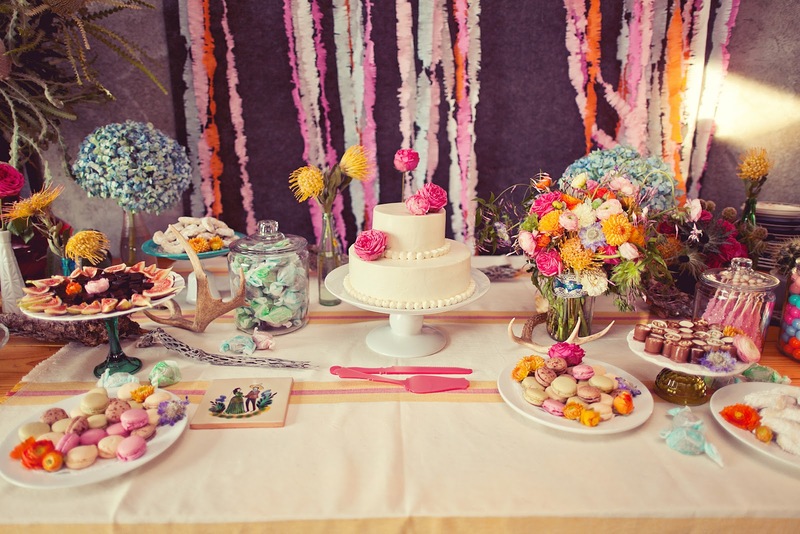 An example of a simple spread come alive with found decor and a crafty backdrop. 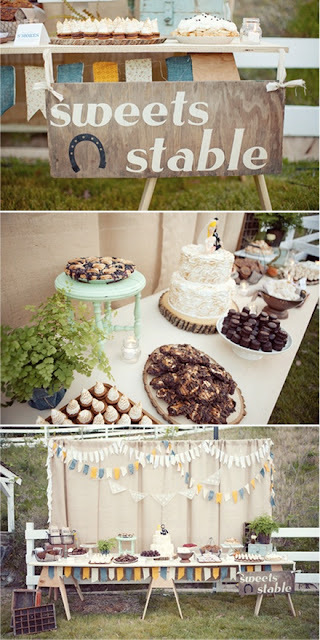 This one is by far the most rustic and one of my favorites. 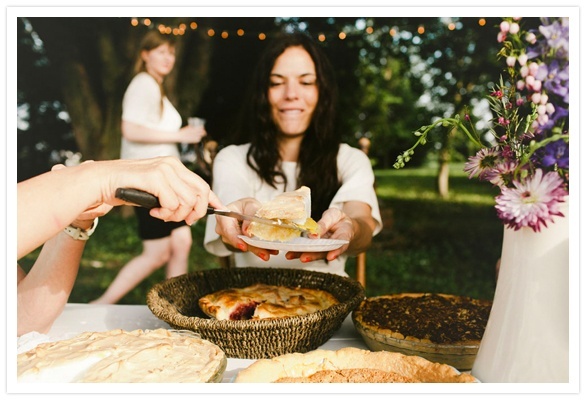 Baskets and basic pyrex pie bowls on a backyard table with wild flowers is so gorgeously simple that it just screams summer party. A monochromatic spread definitely makes a statement. This one is all modern elegance. I love the flat, square dishes and their careful arrangement on the table. 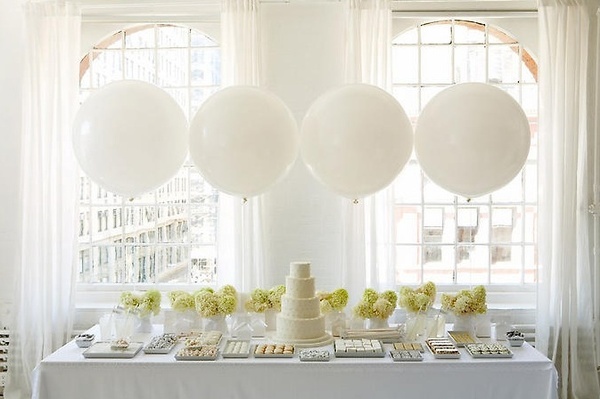 The hydrangeas and Geronimo balloons add balanced contrast that reinforces the monochromatic theme. This minimal assortment of late night donuts is made dramatic against the dark night sky. A delicate stack on an intricate cake stand paired with a bulbous pile of mixed flavors couldn't be more fun or enticing. 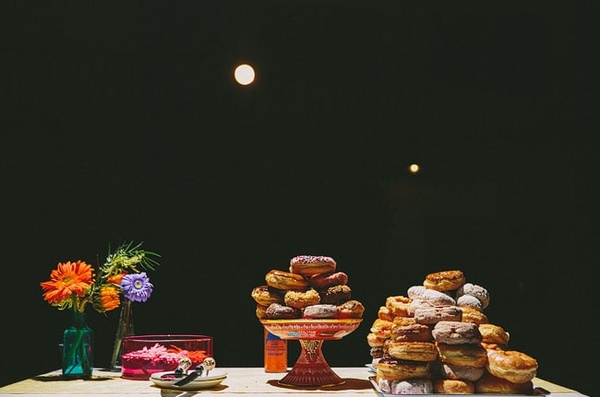 I love when weddings celebrate fun food in whimsical ways, and this one gives a donut table a still life quality.